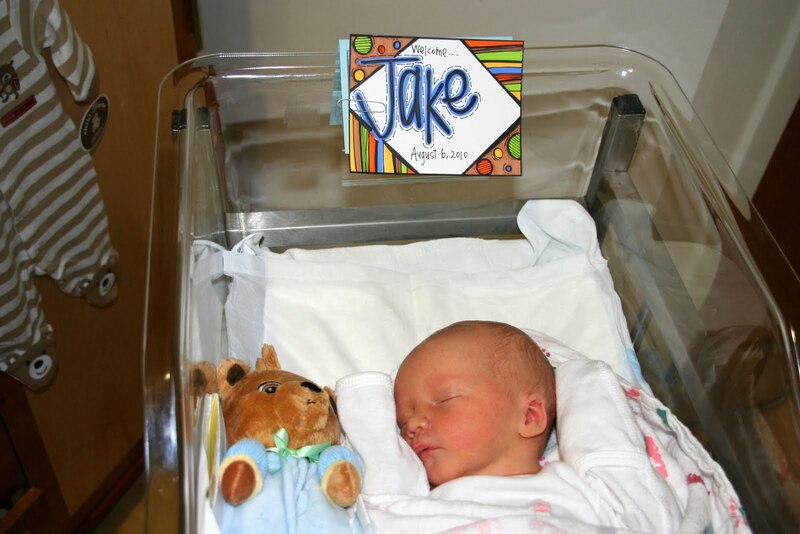 The Truth About Basically Everything: Welcome, Baby Jake! He's finally here! Jake Jason Yates was born Friday, August 6, 2010 at 7:04 am. He was 7 lbs. 7 oz. and 19 inches long. He is so sweet and little and I can't imagine our family without him. This is on the way to the hospital. We had to be there at 5:15 am. I was so grateful that it was early so I didn't have to stress about it all morning. Jason's little white suit didn't exactly fit, but it gave me a good laugh, which I really needed at that moment. Everything went really well with the delivery. I have to admit I was terrified to have a planned c-section. 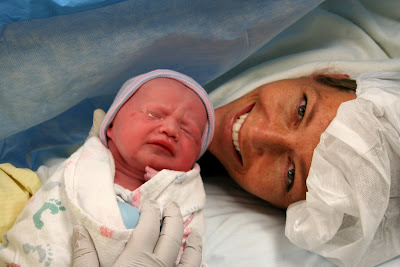 I had a c-section with Abby, but it was a last minute thing and there was so much adrenaline pumping I didn't have any time to think about what was happening. But I've had about 9 months to think about it this time, and I got a little worked up. For nothing. Everything went great. It was my first time having a spinal block instead of an epidural and I have to say, the spinal is the way to go. It's just a shot, so they don't have to leave the big old needle in your back all day. It works within minutes and wears off after only a few hours and I didn't even feel it. All that worry and terror. And I didn't even feel it. What a relief! Then everything happened so fast. It seemed like about 2 minutes until I heard the first cries. There are no words to describe how it feels to hear your baby's first cries. I've experienced it four times now, and those have been the four most incredible moments of my life. Comparable only to seeing and holding the baby for the first time. The worst part about a c-section is that you can't hold your baby right away. Jason held him down by me for a few minutes before they took him off to the nursery, though. Have you ever had a feeling of complete and total happiness? That's what it is. Every time. 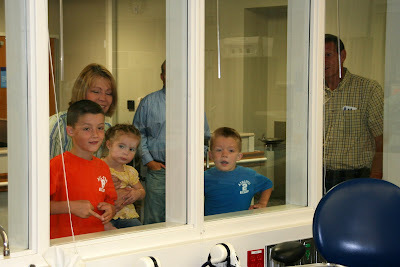 I loved having my kids and both Jason's and my parents there. My parents stayed at our house the night before and brought the kids to the hospital for us. I am so grateful for all the support and love our parents give us. My grandparents were older by the time I was born, so they weren't a part of things like this as I wish they could have been, so it means a lot to me that my kids get to know their own grandparents and get to share so many great experiences with them. And here's the perfect little guy. He has been such a good baby so far. He eats well, he sleeps well, and the kids just LOVE him. I feel so blessed to have such a healthy, sweet baby. Our whole little family. Jason hates this picture because he thinks he looks half asleep, but it's the best I can do. He probably was feeling a little out of it because he spent all three nights on that tiny couch while I was in the hospital. It did fold out into a "bed", but not a very big one. He was such a good sport. It was fun to spend time with just the two of us and the new baby. When will that happen again? It was like a little vacation. We had a big supply of movies to choose from and all I had to do was pick up the phone and room service would bring me/us whatever food I wanted. Jason called for breakfast one morning - "My wife would like french toast, a ham and cheese omelet, bacon, oatmeal, orange juice, milk - and what else did you want, honey? Oh yeah, and a fruit and yogurt parfait." He hung up the phone and said, "I think they might be on to me." You think? I know some people hate the hospital, but man, I love that place. Every time the nurses changed shifts I felt like I was losing my new best friend. Plus, with the pain meds they were pumping into me, I felt like I had been smoking peyote for three straight days. I don't remember a whole lot about it, but I'm sure it was great. This is Jake with the quilt his Grandma Price made for him. She and my dad stayed with the kids while I was in the hospital and she stayed with us for the first five days we were home. 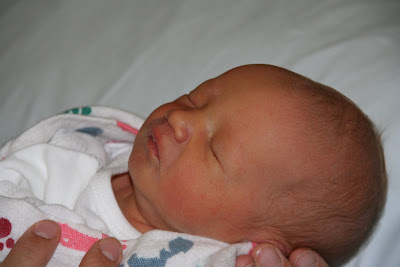 It was so nice to not have to worry about all the little things, and just hold the baby and try to get back to normal. I miss her, but I must be strong. I will survive. I will. 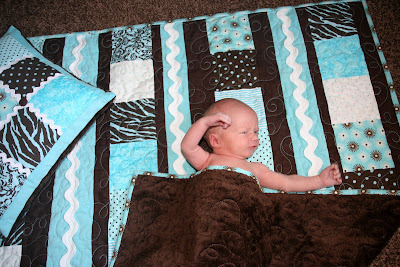 And here is Jake with the quilt his Grandma Yates made for him. She does so much for our family. I don't know what we would do without her. Jake has two very talented grandmas who love him so much. He is a lucky boy. And we are so lucky to have him. His sweet little spirit has made such a difference in our home already. I'm so grateful for a healthy little baby and for all the love and support our family has received in the last few weeks. He is sooo Beautiful. Congratulations!!! Awwwwwww! He is so cute. I'm so glad everything went so smoothly. Can't wait to meet him. 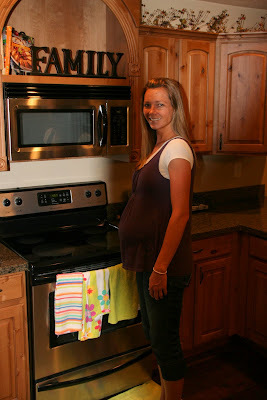 I can't believe how amazing you look right after having a baby, by the way! Congratulations! He is so cute. I love the name Jake by the way. I forgot that I had your blog. After seeing you in Walmart I had to see if you posted pics of this little man. He is so beautiful! You looked amazing and I am really jelous too! Enjoy your fourth little one! He is such a beautiful baby. I'm glad to hear the details of the birth and that everything went perfectly. You are such a great mom and I'm glad to be your friend. 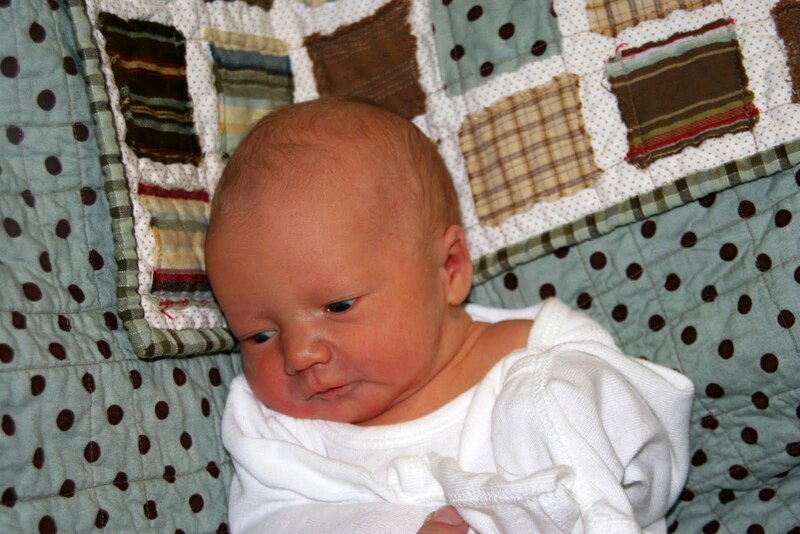 Wow AnneMarie, Jake is SUCH a beautiful baby! SO cute! I just think you are the greatest Mom! 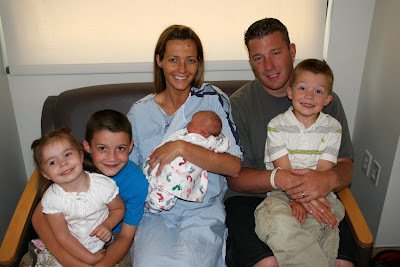 I love seeing how your cute little family has grown from our days of living by each other in Lehi. Take care! Ohhhh, He is PRECIOUS and SO STINKIN' CUTE!! I want to hold him!! You look awesome by the way, too :) CONGRATS! What a sweet little guy! I am so glad that the c-section went well. You always look amazing and you are such a good mom. The gambler believes in the online world.